MA: You and I came of age in the feminist movement and in the radical feminist community – grew up there – you on the east coast, me on the west coast. I remember Kay Gardner and Z. Budapest talking about the Goddess. Both of them had covens, there was a lot of discussion about women’s spirituality and feminist spirituality and I remember having a kind of friendly disinterest in what appeared to me to be ungrounded – unlike politics and culture. I saw these as mediums of social change, gathering large groups of women together to inspire and activate us to change the world. In my twenties and thirties, I wasn’t able to see Women’s Spirituality doing that. Now I’m in my sixties. What I understand now about the spirit that was operating in those concerts, and in theatre works and poetry gatherings and at marches and conferences – what was at work all that time – was a Sacred Feminine Principle. I wonder what the role and impact of women’s spirituality has played in your work? JG: I was raised a Catholic and when I was a kid I went to mass every Sunday morning at 8am. Then I would go to the Baptist church at 11am because my cousin sang in the choir and I went for the music. And I sang in an Episcopal choir because that’s where my girlfriend was. I was surrounded with a lot of spiritual practices as a kid. I left the church when I realized two things: 1) how much the church had been used to oppress people of color all over the world – I was furious and 2) the sexual choices I made would never be approved of in the church. My feeling was: You know what, I don’t like you that much, anyway. You weren’t that nice to me in my parish. They did not like people of color in this particular parish in Boston, St. Francis De Sales – the patron saint of writers! When I was in it – I was really in it. When I wasn’t I really wasn’t. In terms of spiritual practices – I have tried to look more at some of the Native American beliefs. I did get my Native name last year – I got adopted by some members of the Wampanoag tribe in New England and received my Wampanoag name. My grandfather was Wampanoag. My grandmother, who was Iowae, had a lineage chart done for us and my mother did all the paperwork so she could get her Wampanoag name and be put on the rolls. The Wampanoag is an incredibly small tribe and has all these factions so she became part of this one faction and they adopted me and I got my name. MA: Did it make a difference? MA: How does the Wampanoag translation of Still Waters sound? JG: I have an Iroquois translation because the Wampanoag are still reconstructing their language. The Iroquois are one of the Seven Nations in the Northeast so whatever the ultimate Wampanoag translation will be part of the Iroquois tongue. It’s called Ka-ana-to-go-mak. MA: Do you relate to the Feminine Principle? JG: (gesturing to a statue on her desk) This is my Goddess. I think she’s Apache – Goddess of Death and Regeneration. I have had Her ever since Gilda. I definitely think of the Divine as female. When people ask me what my spiritual practice is, I think Feminism: that true belief in the ability of the Feminine Divine to change the world for the better. However it manifests itself – in doing Wiccan practice or running for office, that’s the one thing I do believe in. MA: I’m with you, Jewelle. JG: And it’s a source yet to be tapped. It really hasn’t been tapped. Why are people afraid of women? MA: You’ve spent your whole adult life in the Women’s Liberation Movement which is on-going – we are a part of it even as it came before us and will go one after us. How is it that you say Feminism hasn’t been tapped? JG: It hasn’t been tapped in part because we still don’t know how powerful it is and what we can do with it so we’re still scratching around the edges… still. And the larger culture is terrified and has been busy shoving us into a big open grave as fast as they can. I watch “bad” TV all the time. They had this show on about witchcraft. It was about this growing coven and the only way they had to talk about it was to emphasize the darkness. They talked about how Wiccan spirituality was positive but they couldn’t show any of that. They only showed the negative part, so one of the witches was schizophrenic and she was killing other witches. That kind of interpretation really disturbs me. And that is the usual approach. I just finished this book about the founding of Harvard. It’s an historical detective novel and describes that the people who were the founders of Harvard were the same people who were spearheading the burning of witches. It’s everywhere – the fear of women. And the power of that fear is deeply embedded. MA: So it is extraordinary that we continue to create and produce, that we insist and lead and generate new things in the midst of this juggernaut of woman-hatred. JG: Right… which is sometimes so obvious and sometimes so insidious it takes you a moment to recognize it. 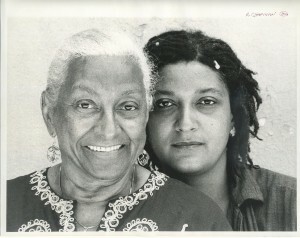 Editor’s note: I am thrilled to have feminist icons Margie Adam and Jewelle Gomez on Epochalips. These two have influenced our generation by paving the way as feminists and out lesbians in the early days to continuing to share their gifts with the world today. Click here for Part 1, Part 2, Part 3, Part 4 and Part 5. ©2013 Jewelle Gomez & Margie Adam. All rights reserved.